Nearly 100 teams raised more than $28,000 for the American Cancer Society during Temple’s sixth-annual Relay for Life event Friday. More than 1,000 students gathered Friday night to raise money and have a night of fun at Relay for Life. But for one student, the event meant more this year than she ever thought. Luminaries burn for those who are fighting or have lost their battles with cancer. The luminaries filled the tennis courts at the Student Pavilion (Jake Siemiarowski/TTN). Last summer, prior to Michel’le Dauhtry’s sophomore year, doctors diagnosed her with leukemia. Dauhtry, a sophomore tourism and hospitality management major, volunteered for Relay for Life last year, but at the time, she was unaware of the impact cancer would soon have on her life. The 91 teams that participated crowded into the Student Pavilion for Temple’s sixth-annual Relay for Life event, a fundraiser for the American Cancer Society. Throughout the night, at least one member from each team walked around an improvised track. “I didn’t mind putting in the time for such an important cause,” said freshman Spanish education major Felicia Samuels. A 20-member student committee, headed by senior public relations major Beth Davis, worked with American Cancer Society representatives to organize the fundraiser. 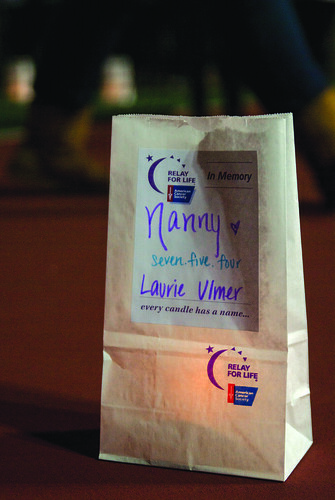 Nationally, Relay for Life events draw more than 3 million volunteers to thousands of relays across the country. As of Friday, Temple students raised $28,000. Davis estimates the committee will be able to reach its goal of $40,000, as participants have typically continued to collect donations even after the event in past years. “We’ll have a little bit of a problem, but not much,” she said, adding that much of the money comes from the $15 registration fee. Several cancer survivors and doctors from the Temple Hospital Cancer Center attended the relay to open the event by walking the first lap around the pavilion, amid cheers from the volunteers. Money donated through Relay for Life will help pay for cancer research to help patients like Dauhtry pay for treatment. It is not out of the ordinary for a single hospital bill for cancer treatments to cost more than $100,000. Much of the donated money also stays local. In Pennsylvania, the American Cancer Society works to provide low-cost housing and transportation for patients who live far from where they receive their treatments. The American Cancer Society also sponsors Colleges Against Cancer, which recently began a Temple chapter. The student organization’s primary function is to educate college students about cancer-related issues like patient advocacy legislation and the role of the American Cancer Society. Don Hoegg can be reached at don.hoegg@temple.edu. Coach Joe DiPietro’s Owls lost 18 straight games this season but salvaged a 3-2 victory over Charlotte last weekend to stop the long slide. Of the 151 medical campuses graded in the Scorecard, 76 of those received less than an average C grade – including the School of Medicine, which received a D.
Jimmy has five children. He and his wife have been using heroin for the past seven months, but he said his children do not know he uses.